What an honor for SpinSheet! We're used to documenting others' awards here at SpinSheet, so to be honored by Leukemia Cup organizers was particularly touching for us. On a steamy August 28 evening, Leukemia Cup organizers, volunteers, racers, and other supporters gathered for an Appreciation Party at Port Annapolis Marina Pavilion on Back Creek in Annapolis. Annapolis regatta chair, Patrick Shannon, grilled hot dogs, burgers, and chicken as party goers mingled, talked about sailboat racing, and enjoyed dinner in the shade of the pavilion. In a short, yet touching awards ceremony, Shannon presented the national 2018 Media Award for Journalistic Excellence to SpinSheet Magazine for more than two decades of support and coverage of Leukemia Cups on the Chesapeake. SpinSheet publisher Mary Ewenson, associate publisher Chris Charbonneau, editor Molly Winans, and marketing coordinator Lauren Mahoney were on hand to accept the award. Others recognized at the Leukemia Cup Appreciation Party were SunTrust Marine Lending for its 26 years of sponsorship. SunTrust vice president Don Parkhurst accepted the honor. The top fundraiser on the sailing side was John Heintz on Team Harbor 20, who was presented with flag and engraved award to be placed in new Annapolis Yacht Club. Team Eastport Yacht Club finished in second place; EYC Commodore Ed Wells was presented with a flag. Team Mummbles placed third for its fundraising efforts. Finally, Leukemia Cup campaign manager Corinne Mayers presented Shannon with a volunteer appreciation award for his tireless efforts as Leukemia Cup chair. 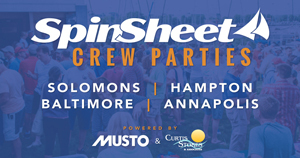 To get involved with planning the Annapolis Leukemia Cup for June 2019 or to make a donation, visit leukemiacup.org/md.